Since our establishment in 1993, teachers and students throughout the Tennessee area have enjoyed our engaging, hands-on, inquiry-based resources. It is the vision of Dr. Susan Riechert to continue to donate our Thematic Units to school systems. However, many teachers and parents have expressed a desire to purchase their own private copies of these resources. How Can I Access the Online Store? Now, BioBox has its own Online Store housed in the University of Tennessee Marketplace of Internet Stores. We proudly announce this endeavor will allow more and more students to discover and apply scientific and mathematical standards based learning. You may access the store (click here). How Can A Tennessee Teacher Access Free Materials? Teachers located in Tennessee area school districts should check with their locate BoxKeeper’s for opportunities to borrow available Units in their collections. Teachers located in Tennessee area school districts that are not currently participants of the Biology in a Box program, should (click here). How Can I Communicate With BioBox Team Members? 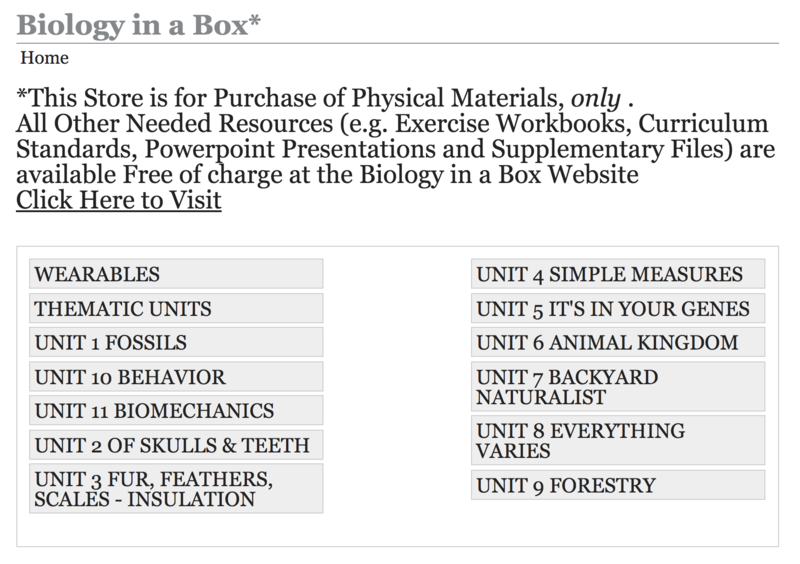 Information about becoming Biology in a Box participants can also be obtained by email. What Does the Store Look Like?